I was debating with myself about how to do travel posts. They’ve been reminiscences up until now. But I tend towards the meandery, which mayn’t be how a lot of folks travel. So I decided to focus more on roads, and talk about offshoots where appropriate. Here goes! Had to start with my favorite part of the state, the Panhandle. I define it as west of Tallahassee ; conventionally it’s further west, on the other side of the Apalachicola River. I was going to do US 90 first, but there’s a lot there, and could run into several posts, so let’s begin with State Road 20. It surprised me that SR 20 was in the Panhandle. Having lived in Gainesville for years, I thought it only ran from there to Palatka. Apparently it’s hidden for much of its length between G’ville and Tally. The things you find out when you travel. So, starting in Tallahassee, go west. In 10 to 15 miles (depending on where you start), you’ll come to the entry road for Lake Talquin State Park. The lake was created when the Ochlockonee River was dammed up in the 1920s. It was ostensibly named for the two cities it’s between, Tallahassee and Quincy. Yet if you look at a map, you’ll see that it’s more between Tallahassee and Hosford. Quincy is the larger city, though, and maybe the namers didn’t like the sound of “Lake Talhos” or “Lake Hostal”. It’s a nice park, and I can see it being especially popular with boaters. Get back on SR 20 and head west. Less than a mile on the left is the Fort Braden Community Center, which used to be the Fort Braden School. It was built in the 1920s and is listed on the National Register of Historic Places. I’ve seen so many buildings listed on the Register that are dilapidated or gone, and it’s nice to see ones that are not only being preserved, but actively used. The next stretch of SR 20 I haven’t travelled myself, so I have to rely on Google Street View. Which is where I found that about 8 miles past the Old Fort Braden School is a major bridge over the Ochlockonee River. The dam that formed Lake Talquin is just to the northeast. There was an older bridge to the southwest as late as 1975, but there appears to be no trace of it now. It must have been demolished when they built the new one. After the bridge, the scenery changes and becomes one of the reasons I love the Panhandle. People who don’t know better think Florida is all beaches, theme parks and overdevelopment. But there are vast undeveloped areas of the state, and they’re likely to stay that way for the foreseeable future. If you enjoy driving not to get somewhere, but to relax and soak in the sights, there are roads aplenty for it in Northwest Florida. Nine miles past the Ochlockonee River bridge is Hosford, which I mentioned previously. Having driven between there and Hosford, I can speak more knowledgeably about this stretch. Not much to see in Hosford, though there is a nicely restored old church. And here’s one of those offshoots I was talking about. If you continue south on SR 65 for about 35 miles through the Apalachicola National Forest, and follow the signs, you’ll wind up at Fort Gadsden, one of the most remote National Historic Landmarks in the state. It’s the site of two forts, one built by the British, one by Americans. There’s not even ruins left above ground, so there’s little to see in the historic sense. If you want to get away from it all, and have a relaxing picnic along the Apalachicola River, this is definitely a place to go. Should the spirit move you, drive south 23 miles until you get to US 98. Turn right (west), and you’ll reach Apalachicola pretty quickly. Turn left, and you’ll be in Carrabelle in short order. It’s also the section of US 98 I like the most. Yes, it is a rather extreme detour. But Fort Gadsden is so out-of-the-way, and the drive so nice from the north or the south, I decided to include it. Back to SR 20. Continuing west is just road and trees and lots of time for thinking. In about 12 minutes (depending on how fast you drive), you’ll be in Bristol, the county seat for Liberty County. This is the least densely populated county in the state. It’s also one of three in the Panhandle that has neither Gulf shoreline or shares a border with another state. There’s not much to see there. The courthouse is nice enough, but nothing special. Unlike the one in the next county over. There’s two offshoots in this area, but I’ll discuss them later. Up to this point, the terrain is fairly level. Now you hit one of the hillier parts of the state as you head west. Which gives you a good view of the 1.5 mile-long Trammell Bridge, which crosses the Apalachicola River. The river is also the divider between Eastern Standard Time and Central Time, so adjust your watches accordingly. Unlike the bridge across the Ochlockonee River a ways back, the old bridge here was preserved and is still in use. So instead of a lane each way, both lanes on the old bridge go west, while the new bridge carries traffic east. In no time at all, you’ll be in the county seat of Calhoun County, Blountstown. Which has one of my favorite old courthouses in the state, which is on the NRHP. It’s Romanesque Revival and very angular, looking more like a church than a courthouse. It’s a couple of blocks away from the current courthouse, which is modern and incredibly drab by comparison. You’ll also find the Panhandle Pioneer Settlement further west, inside Sam Atkins Park. It’s a living history museum, but don’t know much else. The only time I’ve been there, it was late, an hour or so before sunset. That’s not a good time for taking photographs, and honestly, museums aren’t my thing. Especially living history museums. But if you like that stuff, it did look like there was a lot to see. The two offshoots. One north and on the east side of the Apalachicola River (Torreya State Park), the other south and on the west side (the city of Wewahitchka). Each is also halfway between SR 20 and another major road. First, Torreya. From Bristol, go north on SR 12. It’s about 13 miles. The route to the park is not well marked, so use this for reference. And it’s really hilly, so be sure your car is in good shape. Once you get to the park, go to the Gregory House, which is the visitor center. It’s a very old house that used to be on the other side of the river, but was moved to its current location years ago by the CCC. Behind it is a view unlike any you’d expect to see in Florida. You’ll be standing on a bluff overlooking the Apalachicola River 150 feet below. Stretching out before you is miles and miles of forest. The unique topography created a microclimatic area. And with plant seeds and such brought down the river from further north, the ecology is different than anywhere else in the state. I like to go there in the fall because you can actually see a large amount of leaf-color change. It’s not like Maine or Vermont, as it doesn’t have those kind of trees. Still, for Florida it’s pretty amazing. I’ve learned to call the park first, though, because sometimes the color change doesn’t happen quite when you’d expect. The park’s especially interesting to me because it falls under several categories that I like: it’s a state park, on the NRHP, and a National Natural Landmark. Now for Wewahitchka. From Blountstown, go south on SR 71. This one’s easy. Stay on SR 71 and you’ll go right through Wewahitchka. Before you get there, you’ll pass a former state park, Dead Lakes. It’s run by Gulf County now. Don’t know what it’s like, because I couldn’t really find it. Anyway, Wewahitchka. 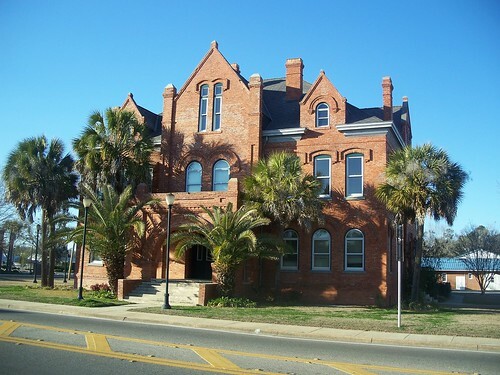 One of those on my list of “places with weird names I wanted to visit.” It’s got one historic spot I know of, the old Gulf County Courthouse. The town is known for its honey. The movie “Ulee’s Gold” was filmed in the area. If you keep going south, you’ll cross the Intracoastal Waterway and wind up in Port St. Joe. I recommend visiting there, but I’ll go into it more when I talk about US 98 in another post. OK, back to Blountstown. Westward is another large chunk of road I’ve not traversed. I like the looks of this bridge over the Chipola River, east of Clarksville. The next 30 miles or so has nothing specifically noteworthy, just mellow driving. Once you get to SR 77, you have the option of continuing west, or going north for the last offshoot. If the latter, take SR 77 north, then SR 279 north. On the right after about 6 miles, you’ll find Moss Hill Church. It was built in 1857, so it’s one of the oldest churches in Washington County. I’m always amazed when I find extant wooden buildings this old in Florida, what with the humidity and hurricanes and all. It’s made of heart of pine, which explains a lot. Our ancestors, they knew how to build to last on a budget. Back on SR 20, go west another 12 miles and you’ll reach the SR 79 intersection. I’ve travelled the rest of this stretch, but from the other direction. There’s another big bridge, this one over the Choctawhatchee River. From this point on, it’s mostly forest, with occasional spots of civilization. Which is another thing I like about the Panhandle. You’ll have these nice isolated stretches, and every 10 or 15 miles there’s a town or city where you can avail yourself of necessities. There are a couple of long bridges across Choctawhatchee Bay which will get you to US 98. Before you get to Niceville, you’ll pass by Fred Gannon Rocky Bayou State Park. I’ve not much to say about it, unfortunately. When I visited, I discovered I’d lost my Florida State Park pass. Fortunately, I was still able to get the stamp for my State Park passport, and I’d seen all the state parks I wanted to on that particular trip, so it wasn’t a big deal. And I replaced the pass when I got home, so it was all good. Niceville is, as it’s name would indicated, nice. I’d always wanted to visit, as I had several friends who were from there. It’s close to some great beaches, so there’s that. 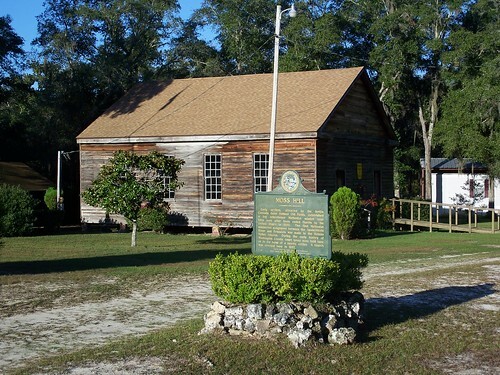 If you go a bit further west on SR 85, then south on SR 397, you’ll be in Valparaiso, and you can visit the Heritage Museum of Northwest Florida. It’s small, so shouldn’t take up too much time. You can also visit the Air Force Armament Museum on Eglin Air Force Base, which envelops Niceville and Valparaiso. So that’s it. And remember to value what’s been, cherish what is, look forward to what’s to be.